Lol. Classic Ed. Come to kind of it, I don’t know if any pickup lines work. Although a character in my novel seems to like them very much (they really aren’t helping him either, though). Huzzah! Congrats on 50k! 😀 😀 I had more to complete my story… and didn’t bother. Ah well… hopefully some day. Congrats on reaching 50k today, Takayta!!!! congrats! I am almost there and I agree with the whole needing 25 k after just to finish my novel too. Ha! I loved this one. The pick up lines are hilarious! 😀 But I am curious, will we get to see Dave and the rest of the gang soon? Hahahaha. Now that’s a creative pickup line. I hit 50k!!! Best. Feeling. Evah! Woohoo, Dawn!!! Mega-congrats on hitting 50k!! Great, I’m like 20,000 words behind where everyone else is, this feels awesome .__. I’d been sitting at 13000 words until yesterday. I’ve now got 18,500 because of my boyfriend’s little pep talk, although that’s still way far behind. I’ve never written so much in one day, ever! 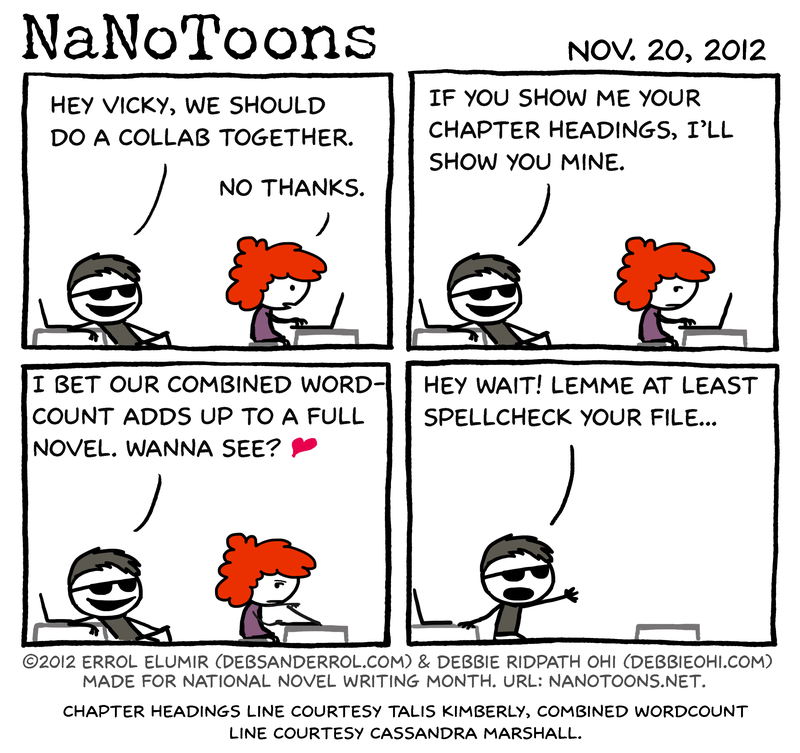 Wherever you are in your novel, don’t give up! Just hack away at it little bits at a time. Good luck! I dunno about Victoria, but any of those pickup lines would have worked on *me*. I once did exactly that when a drunken idiot tried to a) mock me for writing while on vacation and b) then saying he was also a writer since he was a blogger. Close laptop, disappear. Love your cartoons guys! The first nano I did back in 2009 was so awesome in part because I would relate to the characters so much and I’d laugh so hard! Nanotoons are awesome!